Please read these instructions before beginning the lab. Please follow the instructions about program format, variable names, etc. Please use the template in Part 3. Please pay attention to syntax and grammar and language constructs. You can do this lab anywhere, but the lab assistants offer valuable advice not obtainable elsewhere. Programming languages provide a way to express computer algorithms in a form that is convenient for humans and can be translated into a computer's instruction repertoire. Programming languages are the way that we tell computers how to perform a task. In class, we have studied the very low-level instructions that the computer itself understands (for example, the Toy), and talked about a variety of programming languages, much easier for people to use, that are translated into native machine instructions by programs like compilers and assemblers. There are many such languages, each with its own good and bad points, and often with noisy adherents and detractors. In this lab, we're going to concentrate on programming, not on making the web page look fancy. This will mean using variables, arithmetic, loops and decisions, and functions, while doing only minimal interaction with the browser, just enough to get data from a user and to display results. The focus is on figuring out what the pieces are and how to combine them into logic that does a computational task. Programming languages provide a number of piece-parts that you can use to help create a program quickly; in fact, you couldn't do much without some of these, and it would be very time-consuming to create others from scratch. In effect, these component are like prefabricated components for houses -- windows, doors, kitchen cupboards -- that can be used even by beginners to create polished products. Some of the components are basic computational units: functions for mathematical operations (computing a square root or generating a random number, for example), or processing strings of characters (like finding or replacing a word within a sentence, or converting between upper and lower case). Use Firefox, Chrome or Safari instead of Internet Explorer or Edge, which are less helpful about identifying errors. With Firefox, under Tools, select Developer / Web Console to bring up a window that helps identify syntax errors and other problems in your program. In Chrome, select the "..." icon (top right), then More tools / Developer tools. In Safari, Preferences / Advanced / Show Develop menu, then Develop / Show Error Console. This advice will save you a lot of grief. Do not ignore it. This is the basic framework that you will now flesh out -- the single alert will gradually be replaced by more and more statements. You should create this file with whatever text editor you used for the earlier labs, using plain text. [Mac TextEdit users: be careful to save as plain text.] Be sure to save the results often, and reload the resulting web page after each change so you can be sure that your changes are working. Frequent small steps is the best strategy for both web page design and programming. By the way, Firefox, Chrome and Safari have a handy alternative to alert. If you use console.log(...) instead of alert(...), the results will be printed in the Console area instead of as a dialog box. Highly recommended. This comes from the body. This comes from the script. This comes from the body. That is, output from the script at the beginning comes before the body text because the script occurs before the body in the page source. If you put the script after the body text, however, the output order will also be reversed. We'll use document.write to produce some of the output for this lab. You can also use it as an alternative to alert and the console log for debugging. Some browsers, bless their hearts, do not always display output from document.write until after the page has been processed. Use Firefox if you want to see output as your program runs. The library function prompt is a sibling to alert; it pops up a dialog box with a message and a place for you to type a value; it's used in the Toy simulator. Whatever you type is returned as a sequence of characters that can be used in the rest of the program. This sequence of statements declares a variable called reply. It then calls prompt and stores the resulting value (what the user typed) in the variable reply. Then it displays Hello and the reply text. The operator + joins two sequences of characters into one longer sequence of characters. You'll use it a lot in this lab. Then you can use the user's name later on in the program by using the variable username. If you need a literal string of characters in your program, like Hello, there, enclose it in either single ' quotes or double " quotes. If the string contains one kind of quote, you can quote it with the other. If you inadvertently omit a quote or don't balance quotes properly, it's an error and the most common symptom is that your program just doesn't work. Operators are special symbols like the + and - of ordinary arithmetic. An operator acts on values and variables to compute a new value; an expression is a legal combination of values and operators, like (my_height+your_height)/2 or area = pi * r * r.
A statement computes a value or does some other operation. For our purposes here, the main kinds of statements are simple function calls like alert("...") and assignments like x = 1. More complicated statements are described below. If the condition is true, then the statements are performed, otherwise the other_statements are performed. Both groups of statements can be one or more lines. The braces surround the groups; you can omit them for a single statement, but it's safer to use them all the time. Make sure you understand how this piece of code works. How would you modify it to work with Celsius temperatures? As long as the condition is true, then the statements will be repeated. (That is, the condition is tested, and if it is true, then the entire loop body is executed, after which the condition is evaluated again.) As with if-else, the condition is surrounded by parentheses, the statements are surrounded by braces, and indentation is used to make it clear what is included in the loop. The return statement transfers control back to the function's caller, and sends a value back too if there is one. Notice that the statements of the function are enclosed in braces and indented. Functions usually have parameters, so that they can operate on different data values, just like alert and prompt do. Thus ftoc has a single parameter, the temperature to be converted, which will be referred to as fahr within the function. Variables declared within a function are only accessible within that function; variables declared outside of any function are accessible anywhere in the program. Your assignment is to implement a program that will play the old guessing game "I'm thinking of a number between 1 and 100". A no-frills version is only about 10 lines of code, and you should be able to do something nicer in fewer than 20 lines. If yours is getting much bigger than that, you're probably off on the wrong track and should review the notes and examples. When the page is loaded, a confirm dialog box asks if the user wants to play the game. OK means yes, Cancel means no. When the game starts, it generates a new secret number, then prompts the user to enter a guess. When the user enters a new guess in the "Guess my number" prompt, the program displays the appropriate message (like "50 is too high", "25 is too low", "37 is right"), using alert or prompt. The guess should also be displayed on the page with document.write. 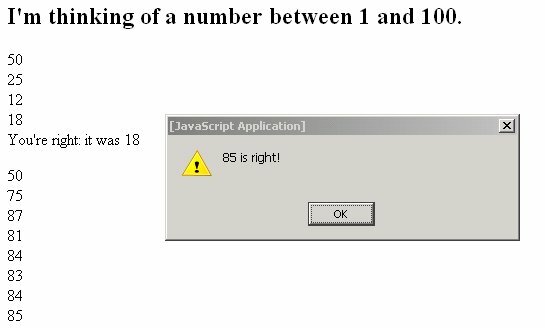 If the answer was wrong, the user is prompted for another guess. If the answer was right, that's the end of this game. The program tells the user it's right and displays the answer with document.write. The user should then be asked about playing another game with confirm. OK means yes, Cancel means no. It's a nicer user interface if you combine the appropriate too high/too low message with the prompt for the next guess, but it's not required. You must put all of the logic for playing a single game in a function called play1game. The main part of your program then consists of a while loop that asks the user whether he or she wants to play a(nother) game, and if the answer is OK, calls play1game. Writing a separate function cleanly separates the logic for deciding whether to play again from the logic for playing one game, and you can test them separately. In particular, you can write a temporary version of play1game that just prints a message and returns, to be used while you're worrying about managing a sequence of games. The built-in function Math.random produces a different (pseudo-)random number between 0 and 1 each time it is called. Multiplying that value by 100 gives a number (including a fractional part) between 0 and 99.999... The built-in function Math.floor discards any fractional part, leaving an integer between 0 and 99. Adding 1 to that yields an integer between 1 and 100. The next step is to fetch the guess that your user makes. This is the value that comes back from calling prompt. Store it in a variable called guess (which you must declare). Your code should handle Cancel and empty input properly; see the description of prompt above. Now you can go on to the real logic of the program: is the user's guess too high, too low, or just right? Your task is to do this test and decide what message to display and what to do subsequently. This will require a while loop that continues while the guess is not equal to the secret value, an if-else sequence inside the loop that compares the guess to the secret number, and another prompt() to fetch the next guess. Look back at the discussion of control flow and the examples in the class notes if you need to. Re-read this paragraph. Use alert or console.log statements to display results as your computation proceeds, or to verify that your program is doing what you think it is. These are easy to add and help narrow down problems quickly. Inside your program, literal text values must appear inside quotes (e.g., "What's your guess?"). The + sign is used to join two text strings to form a new one (e.g., "Hi " + "There" is the same as "Hi There"). If you find that your program is printing text when you wanted numbers, use the parseInt function to converts a sequence of ASCII digits into their integer value. When you prepare your lab for submission, you should leave any debugging statements in the program source code, but "commented out" so they can be easily restored if something goes wrong. Make sure that you have implemented what we asked for, listed above. When we grade, we will be looking to see that your program works, that it's reasonably cleanly written (properly indented, for instance), and whether you did anything special to make it more than the bare minimum. For instance, you could add a line or two to offer the user an upper limit different from 100, or a couple of lines to count the number of guesses. Upload lab5.html to the CS dropbox for Lab 5 at https://dropbox.cs.princeton.edu/COS109_F2018/Lab5. Optional: If you wish, you can copy your lab5.html file to your cPanel site so others can play your amazing game.